Before I even began this book, someone spilled the beans on the death of a major character. Because I thought at the time that it was a major spoiler and some friends had said it wasn't as good as the original instalments of the books about our favorite 30-something singleton, I put off reading Bridget Jones Mad About the Boy for quite a long time. Once I realized how dangerously close I was to seeing the new movie, I knew I'd better get reading and I was quite surprised... As it turns out, it wasn't a spoiler at all, but something that's clear right from the beginning of the book and the naysayers were wrong... This Bridget is great and given that I only read the first one a couple of years ago, I feel as though I can relate to this book a lot more. Though Jones may be older and a mother in her 3rd print adventure, she's living in the modern world, navigating the strange and sometimes absurd world of online dating & Twitter and mastering the art of dealing with today's parenting, something that I think is altogether different than the parenting most of us grew up with. Something that struck me from the very beginning of this novel is that the movie is not at all going to be like the book. The characters are not the same and when this book begins, Mark Darcy has been dead for quite sometime (I know, super sad, but I promise this isn't really a spoiler...) and Bridget already has two children, so it's safe to say that Bridget Jones's Baby is another story about another time in the life of this literary heroine. Here's how I look at it though... It's like getting two Bridget reunions instead of just one and since they're both wildly different stories, there's no painful comparisons to be made. In short, don't worry about whether you'll like the book better or the film... The author Helen Fielding has had her pencil at work on both the book and the screenplay, so you can be sure that our girl Bridget will be her charming, adorable self in both. Also, it's hard to imagine Bridget Jones without Rene Zellwegger coming to mind, so it's worth seeing what's sure to be another stellar performance by the actress in the role that made her a household name. When Bridget Jones Mad About the Boy begins, we have an all new Bridget with recognizable, subtle traces of her old self, few and far between though they might be. She's widowed, raising two children, living a bit more of a luxurious life thanks to her marriage to Mark Darcy, but there's one major exception... She's very, very sad. She's not the upbeat Bridget we all came to know and love. While she still indulges in a little too much drinking and a whole lot of cheese, the sense of hope seems to have left her because she's in a place where it seems there will never be anything to look forward to again, unlike when she was single and had everything to look forward to if only she could just get started. This is a Bridget we haven't seen before, who's older, more mature and has been touched by the heartbreaking unfairness of life, a girl who didn't have everything go her way once she got the fairytale. She's broken and in unfamiliar territory... What's so great about Mad About the Boy is that it's the timely story of a woman who feels overwhelmed in every possible way, trying to finding her way back to her old self and desperately striving to create a new normal under abnormal circumstances in her current stage of life. Get ready for charming interactions with Daniel Cleaver, hilarious drinks with the familiar friends we all wish we had, the hilarious sexual encounters of a once again singleton, quips from Bridget's mum that will have you in stitches, a few new fabulous friends that you could only ever meet in London, school run antics that could only happen to Bridget, laugh out loud passages, brushes with danger, high drama, heartwarming romance and there's even a toy boy I'd dare you not to fall in love with. Bridget Jones Mad About the Boy is endearing, whether you're single, widowed, dating, divorced or like me, happily hitched. It's a story that everyone can relate to. I would compare this new version to the classic Bridget Jones's Diary meets Bad Moms. We're all too busy, incredibly overstretched, sleep deprived and desperate for some me-time. On top of that, add new social media responsibilities and all the other new things we're supposed to be doing like keeping up with the latest diets, going to the hottest (and most expensive) new exercise classes, competitive school runs, excessive networking, pain-inducing, time-consuming beauty maintenance, etc. and it all becomes overwhelming. I'm sure most of us can relate to the feeling of failure (I know I can), because there's always too much to do and never enough time, energy or resources... It's not enough to be good at one thing like being super physically fit, a great mother or really good at your job. There's this constant overwhelming feeling that we need to be perfect in every aspect of our lives every single day and still have time to schedule in a yoga class, a bikini wax and daily meditation without breaking a sweat, falling behind on work, missing a Tweet or Instagram post or gaining a pound, all while having dinner on the table, all the laundry done perfectly and scoring that ever-important promotion. There was always something so endearing and relatable about Bridget being a train wreck disaster, wearing way too much blush or saying all the wrong things, but seeing her be herself in these totally new circumstances, taking on the challenges of modern women and the struggles of striving for perfection, all while trying to be the perfect mother and date in the digital age brings the ridiculousness of these unrealistic expectations to the forefront and makes it, well... Funny. Whether you're heading out to see Bridget Jones's Baby or not, I highly recommend picking up a copy of Bridget Jones Mad About the Boy. It's a great read and unlike so many disappointing revamps, it brings an iconic character from 15 years ago into the modern age so we can fall in love with her all over again. Furthermore, there's nothing better to read as we cozy up into Autumn as these books always contain an idealistic portrait of British and London life that seems to pair nicely with a cup of tea, a wooly sweater and a snuggly blanket. I'd love to see Helen Fielding turn out loads of Bridget Jones novels, making her a long-lived, multi-novel classic series character. The return of Bridget is like running into an old friend for the first time in years - we're both completely different and yet the same, but it seems like no time has passed at all, so we pick up right where we left off. I think I'd enjoy reading about her antics and adventures right on up through her years in the nursing home! 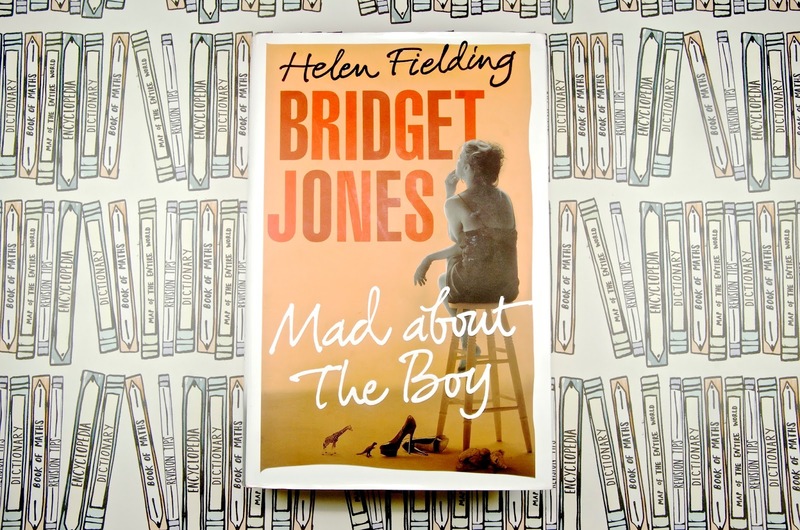 Click here to pick up your copy of Bridget Jones Mad About the Boy. If you've already read it, I'd love to hear your thoughts on the book in the comments below or head over to @pinkjulep on Instagram and let me know what you thought of it there!